Photographs are the mirror of human experience and emotions. Traveling to Maine is always a worthwhile one. The opportunity to commune with Mother Nature and the delight of going back to the basics and essentials in life is beyond any price. When one visits Maine, there are a lot of amazing things to indulge with to make your trip a memorable one. Traveling and food delights go hand in hand. One of the most famous dishes being offered around Maine is lobster. This fine art image was captured on a lobstermen shack around Maine offering the best tasting lobster there is. For those who would explore while waiting for their monstrous lobster meal, grabbing a camera and capture snap shots of the gorgeous sunsets or the azure horizons is a perfect way to end a long day. Lobsters are considered as the major players in the economy of Maine. It was said that in 2012, the harvested lobsters exceeded 126 million pounds and was able to generate 338 million dollars in dock or ex-vessel value. With over 5,900 licensed and qualified lobster harvesters and a wide array of marine outfitters, retailers, processors, dealers and restaurants, lobster is one of the vital components of the fishing industry. This in the state of Maine has sustained the villages and communities around it through the years. 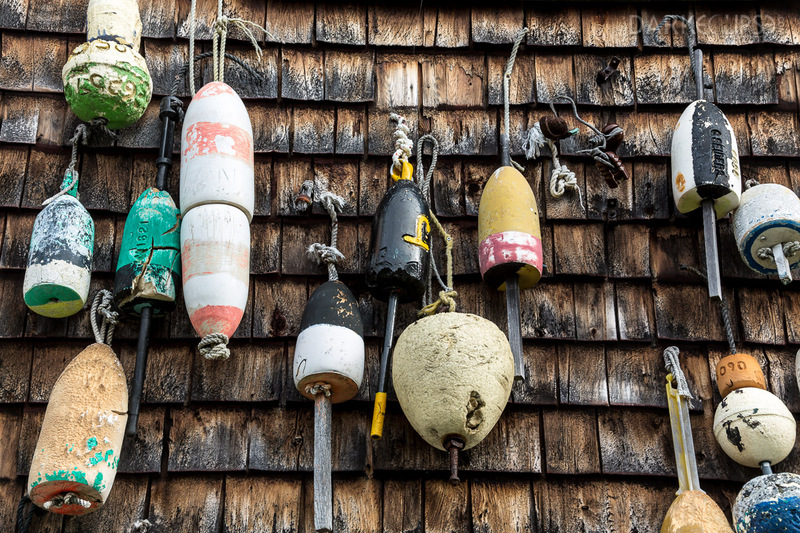 This picture of lobster buoys hanging on lobstermen shack is would make a rustic addition to a home or office interiors. The rugged look of this image is a nice addition to the boy’s room or a crafty piece to add in a vacation house. It will be a creative addition to any empty space you want to brighten up.